We don't agree with celebrating Halloween, but we do believe in fun! 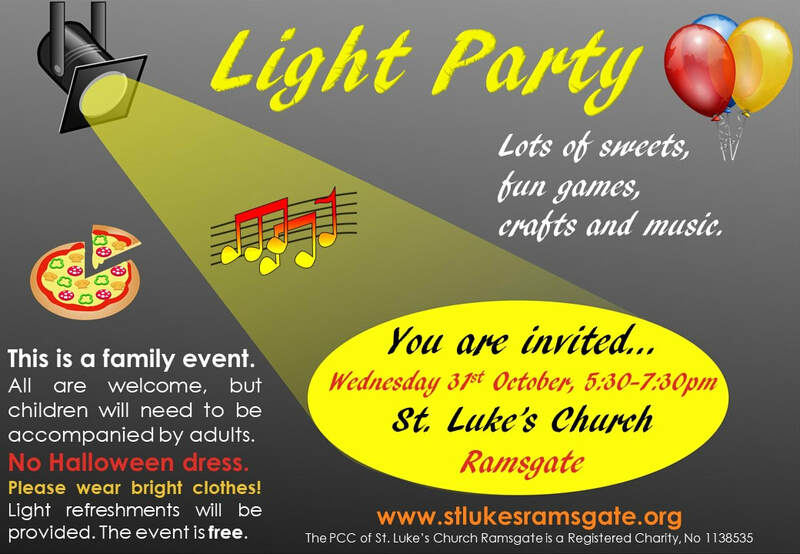 So why not join us at St. Luke's for this year's Light Party. ​This year, as last year, our Light Party is for all ages, but children will need to be accompanied by adults. All are welcome, whether you are a regular at St. Luke's or you've never been before. No need to book, just turn up. The evening will begin with tea and coffee for adults and games for the children from 5:30pm. ​There will then be some songs and storytelling followed by a period of time when you can choose from a range of activities, from traditional games to craft to prayer activities. You can focus on one activity or do a selection. ​We will then have some more singing and an epilogue, followed by a simple buffet tea at about 6:00pm. The event will finish at 7:30pm.